Introducing the new generation Supermicro Resource Optimized SuperServer® family, initially consisting of WIO server systems (WIO is the new version of UIO with 3/6 non-proprietary industry standard expansion slots in 1U/2U form factors), and the 6 WIO+ systems featured above that provide further advanced capabilities. 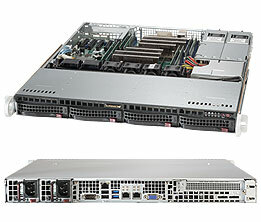 This distinguished collection of high performance Intel® Xeon® processor E5-2600/E5-2600 v2 based DP and UP servers and serverboards offers significant advantages over the previous generation including better performance with up to 8 cores / 16 threads per CPU, twice the memory capacity with an additional fourth channel per CPU for up to 768GB of up to Reg. ECC DDR3-1866MHz memory, and two QPI links running at up to 8 GT/s each. Resource Optimized systems offer improved throughput with up to 80 PCI-E 3.0 lanes, SATA 3.0 (6Gb/s) and SAS 2.0 (6Gb/s) storage options, denser connectors for better signal integrity, Platinum / Gold power supplies, and improved manageability features. Supermicro's signature high quality and strong product support are a given. <span style="\&quot;color:rgb(0," 0,="" 0);="" font-family:arial,verdana,sans="" serif;="" font-size:11px\"="">The result is more work accomplished with higher efficiency and lower costs. Based on the Intel® Xeon® Processor E5-2600/E5-2600 v2 family, these feature rich, high performance Resource Optimized servers are designed for Virtualization, Simulation, Automation, Database, and Storage applications in Enterprise, Data Center, and Cloud environments.